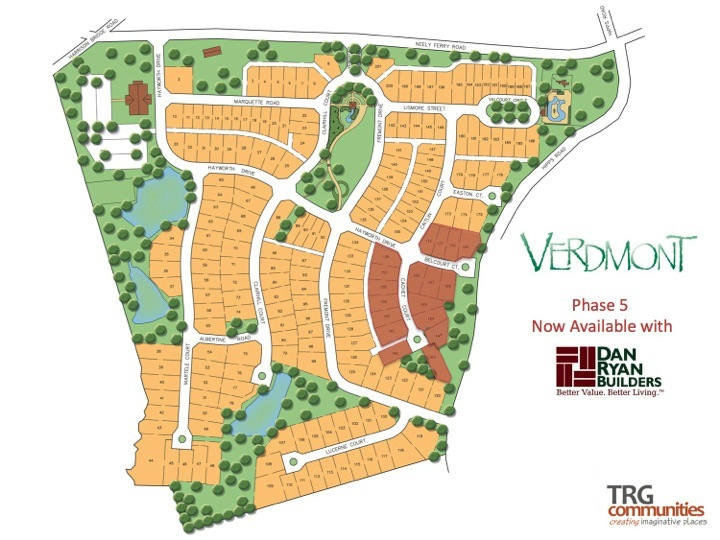 At TRG Communities, we are pleased to announce Phase 5 is now under construction in Verdmont, one of the most celebrated Simpsonville communities with imaginative features, including a picturesque central park, traditional neighborhood design, farmer's market pavilion and a resort-style pool. After increased demand, 17 new building opportunities will be available in the coming months. These homes will be exclusively built by Dan Ryan Builders who has been recognized as a premier quality and value home builder. Check out Dan Ryan Builders for available floor plans and styles for your next home or contact Holly May, the Dan Ryan Builder's Verdmont agent at hmay@danryanbuilders.com. Don't delay because these opportunities will not last long, many are already being pre-sold for immediate development! Be sure to check out Verdmont to experience all that this community has to offer for the newly-wed couple to the empty-nester retiree.